With the students of Dance from the University of Hyderabad and their much revered Head of the Department Dr Anuradha Jonalagadda. Missing all the college campus fun does leave a void in the long run. And most dancers would ascribe to this opinion, what with their career converging mostly on performances, travelling and on and off friends. Yearning for a raw experience of what campus was like for students of dance, the team Kalaparva headed to the Hyderabad University for a colloquial chat and discussion. Dr. Anuradha Jonalagadda, HOD, Department of Dance (a very easy going self sans the austereness that any other person in her position would have!) went out of her way to facilitate this. Students featured are all from the First year MPA (Kuchipudi and Bharatanatyam). 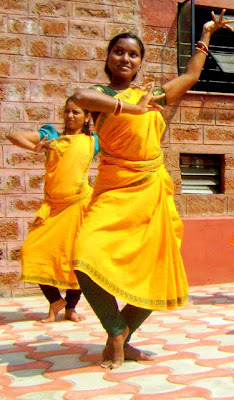 Ms. Sahiti Reddy (Kuchipudi), Ms. Krishna (Kuchipudi) Ms. Aswathy Rajan (Kuchipudi) and Ms. Neethu Krishna (Bharatanatyam). Each of them can be considered “Interesting cases” of study, given their tryst with dance! We are thoroughly rooted, but at the same time absorb new ideas and new areas of openings that are coming up in the area of dance. We adhere to the University’s motto of saa vidya yaa vimuktaye, which means, that is the true knowledge which leads to final liberation be it of mind or of ideas. Sahiti is an entrepreneur, but chose to waive all the responsibility for two years to come back to dance. Neetu, Aswathy and Krishna are all from Kalamandalam (the much seeped in tradition Kerala Amme’s) truly substantiating their rigorous training. The first thing that went shooting was why this path to study dance leaving behind a tempting performing space. 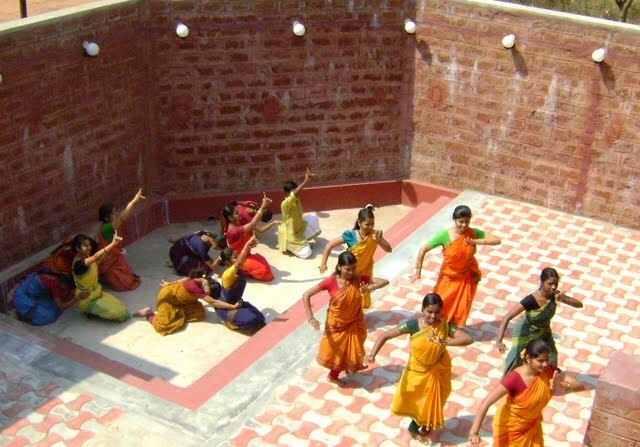 Well, for Sahiti it was the ocean of theoretical knowledge she wanted to engulf and for the Kalamandalam students, the only abode to soak into in depth and traditional Kuchipudi and Bharatanatyam. The Department itself, housed in the Sarojini Naidu School of Arts and Communication boasts of a very elegant structure, serene interiors and homely atmosphere justifying the students’ say of finding the right tranquility for study. No wonder then that all the compromises are worth of and the University is very popular among the dance pundits. Says Dr. Anuradha - "We strive hard to preserve the traditions, but at the same time also keep our mind open to the latest that is happening in dance. This is, I think, the legacy we inherited from the founder members of our department. We are thoroughly rooted, but at the same time absorb new ideas and new areas of openings that are coming up in the area of dance. We adhere to the University’s motto of 'saa vidya yaa vimuktaye', which means, that is the true knowledge which leads to final liberation be it of mind or of ideas." A typical day in college for them would mean practical sessions from 10A M to 1 PM, learning new items of the teacher’s repertoire. Such undivided attention is supplemented by in house mridangam and vocal teachers always accompanying their lecturer. Their music teacher Shri D.V.S Sastry is somebody they trust on for all their projects and assignments. The second half would concentrate on theoretical aspects like kinesthetic, musical aspects in dance, dance history, textual traditions and so on. The college supports with a well maintained library as well. Quizzed on what they would have missed if they had not taken this plunge, the Keralites are quick to chip in that while they have been into Kalamandalam since childhood learning dance academically, traditional Kuchipudi is what beckoned them here. For Sahiti, apart from the exhaustive theory that the course imparts, it is the study of allied arts like music, lighting, stage and make up that is lucrative which otherwise one would never dig out time for. Whoever said art is no rocket science and these students come across as a standing example. Krishna, Aswathy and Neethu have been away from home since the time they remember. Their schooling was at Kalamandalam and now they find themselves here pursuing dance further. With the weekends giving no time for a long distance travel, they get back to their ‘Home sweet homes’ only during semester breaks. Despite this, their dedication to the art is awe inspiring as they opine they would want to immerse in just the study of dance as long as they can. 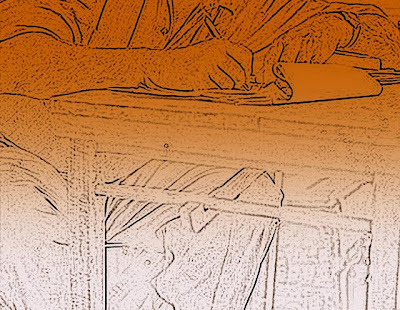 Banaras Hindu University and Jawaharlal Nehru University top their list for further studies. Societal apprehension of a career in dance is what Sahiti has had to fight against. She has stood tall against all the peer pressure of science academia and high paying jobs to carve a niche for herself in dance. After this stint at the University, she has plans, though in its amateur stages, of setting up an entrepreneurial venture dedicated to bring to light the work of rare artistes not often in the forefront. She also sees herself being a youth face of organizations like Spicmacay to patronize the arts. All of them though voice their concern over a general disinterest and lack of exposure among the public towards classical dance. As they compare scenarios where a classical dance recital attracts a full house in the University, it fails outside and see this as a worrying factor. However the young optimistic face pops out quickly assuring that the current generation would preserve the classical arts. On a rather hard coaxing, they come out with some advice to the upcoming students in saying that the University is a storehouse of knowledge. While there, one should just grab everything that is offered. They particularly are in admiration of their HOD who is a body of great help. Finally they assert unanimously "Art is for art sake and nothing else" as they sign off to catch up their last exams of the year before the term break.